Operating hours: Mondays 9am to 4pm; Tuesdays to Fridays 9am to 5.30pm. The cut-off time for submission of permit applications is 2pm. The Regulatory services is responsible for regulating access to the cross-border road transport market, freight and passengers, through a permit administration regime. The regulation of market access is geared towards improvement and promotion of social and economic development and regional integration through progressive market liberalisation. This service is also tasked with ensuring compliance with the C-BRTA’s empowering legislation and related legislation, as well as the provisions of the bilateral and multi-lateral road transport agreements. Research and Development division provides value-adding advisory services on cross-border transport sector matters to the Minister of Transport and other stakeholders. It also promotes the development of the cross-border industry. 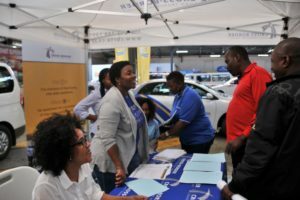 In addition to advising the Minister of Transport on regional transport imperatives and challenges, this division’s role is to monitor and act against any restrictive measures that may be implemented by other SADC member states. The delivery of the division’s outputs is in the form of in-depth and innovative research, which informs policies, strategies and legislation with respect to cross-border transport and trade matters. Stakeholder Relations division, provides operational support to cross-border operators regarding conflict resolution, resolution of constraints and impediments, and dissemination of information relevant to their operations. The division establishes and maintains cooperative and consultative relationships with key stakeholders in the SADC region. Stakeholders range from international, national, provincial and local authorities to passenger and freight operators, and any other relevant stakeholders who work for the benefit of the cross-border road transport industry.